Heptathlon scoring involves converting distance, time or height measurements into a universal points system. The result? A complex scoring system that relies on algebra. In the heptathlon, heptathletes are tested at seven events in running, jumping and throwing. But the scoring also tests their maths! Because the heptathlon involves different types of events, it is difficult to compare athletes' performances in the competition as a whole. In running events, for example, athletes want a low time. But in javelin they aim for the highest distance possible. And whereas high jump is measured in centimetres, the shot put is measured in metres, and the hurdles in seconds! 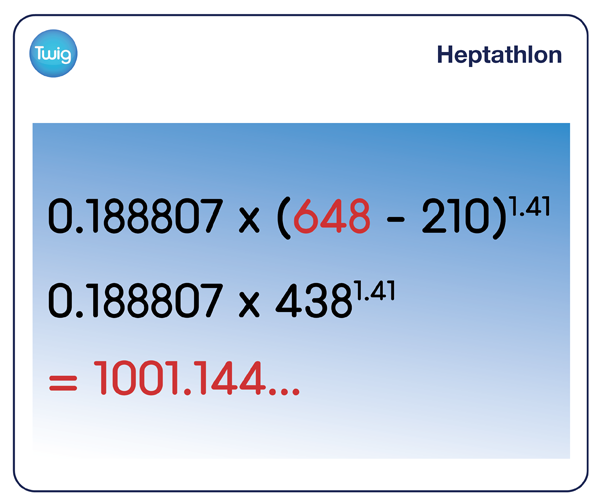 The heptathlon uses maths to get around these issues. A standardised points system uses algebra to compare time with distances and level out results accordingly. Each type of event has its own equation to find the athlete's position, depending on what is being measured. For running events, T is the athlete's time in seconds. For jumps, M stands for measurement in centimetres. And for throwing events, D is the distance achieved, in metres. To complete the equations, and rank the athlete's position, constant values a, b and c are assigned for each individual event. Crucially, these equations ensure that the points reflect the standard of the performance, not simply whether a number is high or low. Benchmarks indicate what competitors should be aiming for. These indicate the time, measurement or distance the athlete would have to achieve to score 1000 points for each event. So if a heptathlete ran the hundred-metre hurdles in 13.85 seconds this would plug into the equation to give them 1000 points, which indicates a world-class score. If another heptathlete cleared 648 centimetres in the long jump, that would also equate to 1000 points. In recent years, as heptathletes improve, the world record has broken the 7000 points barrier. Leading to speculation that new benchmarks might eventually be needed.